PowerVoice handles your auto dialer, voice mail and lead generation finctions. PowerVoice is a complete multi-line hardware and software solution for your call transfer and interactive voice response (IVR) applications, and it allows you to run different applications on different lines. Select Your Script from our selection of predefined applications (scenarios) that come with the PowerVoice for Windows application generator. Schedule times and days of week for your calls. Outbound telemarketing can be used for lead generation, school, church and group hotlines, collection systems, membership notification systems, surveys, polling - any organization that needs to quickly contact large numbers of people. Hours of Operation: Courteously set your days and hours for dialing. Do-Not-Call List: Automatically allow callers to place themselves on the Do-Not-Call list. Quick Disconnect: Free up the called party's line as soon as they hang-up. True Answer(tm): Accurately recognize answering machines and (if you want) play your message immediately when their message ends. If you want, you can use one message for answering machines, and another for live answers. Also, accurately recognize fax machines, intercept tones, and modems. Multiple Response Types: It is your choice to get responses via either recorded messages or digits pressed by called parties. Database Dialer: PowerVoice automatically places calls from your company's database of telephone numbers. It can also easily import numbers from an outside source or your favorite CD (Phone Search USA, X-Map, etc.). Prefix Dialing: Just insert one of your local prefixes or an area code and the prefix in that area code you want to dial, and PowerVoice will randomly dial all 10,000 numbers of your desired prefix. Call Logging: PowerVoice logs completed calls, and retries busy and non-answered numbers. Increase Productivity: Run multiple applications simultaneously on different lines. The COMPLETE PowerVoice package includes Windows 2000 PowerVoice software, PowerVoice 4 hardware card, documentation, and FREE software updates. 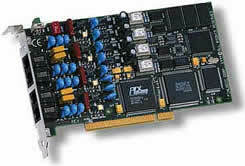 PowerVoice is also available in a Turnkey Configuration with PowerVoice hardware & software and Windows XP fully installed in a fully functional 800+ MHz computer with an Intel processor. And we can configure any Turnkey system to your exact specifications. Outbound dialing scenarios for auto dialer applications are predefined scripts during which a telephone number is automatically dialed, activity occurs after the call is answered, and finally, the call is disconnected. After you've determined your specific needs, you can select from several different scenarios that are provided with your PowerVoice for Windows system. Information below describes how the basic scenarios operate. Script A: A call is placed and the phone is answered, after which - your message is delivered and the called party has the option to have the message repeated or to hang up. Script B: A call is placed and the phone is answered. The called party is given the option of pressing a key to hear your message or hank up. If the caller chooses to hear the message, your message is delivered and then the called party called is given the option to have the message repeated or to hang up. Script C: A call is placed and the phone is answered. Your message is delivered and the called party is given the option of repeating the message or verbally responding to question(s) by pressing the '1' key or by pressing the '2' key if merely touch-tone input is needed to provide "yes" or "no" answers to questions offering only two choices. Script D: A call is placed and the phone is answered. Your message is delivered. The person called is given the option to answer question(s) or hang up. If the called party chooses to answer the question(s), he or she may be queried for as many as ten questions requiring VOICE or TOUCH-TONE responses. After the questionnaire is completed, the called party is "thanked" for their responses and the call is terminated. Script E: A call is placed and the phone is answered, your message being delivered. The called party has the option of transferring the call or hanging up. If the person called presses '1' to have the call transferred, they are placed on hold and the call is transferred to a preselected telephone number or extension. Scenario 6: A call is placed and the phone is answered, your message delivered. The caller is placed on hold and the call is automatically transferred to a preselected extension or telephone number. Script F: Similar to the previous script, a Predictive Dialing call is placed. If a "live person" answers - a beeping sound plays through the computer's speaker and the name and phone number of the person called pops-up on the screen. An operator can immediately pick up the telephone and speak with that person. While the scripts detailed above handle the vast majority of auto dialer scripts required for telemarketers, lead generation companies, groups, clubs, groups and churches - there may be a scenario specific to your needs that isn't listed above. If that is the case, Talking Technology can craft a script at a reasonable rate to meet your needs. We also have professionally trained talent that can create great sounding messages. Contact the Sales Department at Talking Technology to discuss your needs and for a quote for your application. The PowerVoice for Windows XP package is available in a Turnkey Configuration that includes complete installation of the PowerVoice package (PV4 voice card and PowerVoice software) and Microsoft Windows XP in a fully functional Intel-based computer (monitor ready). Our computer is fully equipped with FDD, HDD, CD-ROM, keyboard, mouse, graphics card, built-in Sound Blaster compatible sound card, speakers and all required drivers. Just hook up a monitor and phone lines and you're ready to go. And remember - all PowerVoice for Windows packages come with three hours of technical support! Click 'Buy Now' to order from our Secure Server! * It is important that you determine the legality of automatic announcing and automated dialing applications for use in your specific locale. Some applications may not be allowed where you live or places that you want to dial into. Laws vary from country to country, state to state, and in certain areas, city to city. It is the sole responsibility of the developer and user of an automated outbound application to ascertain legality of that application prior to its use. Talking Technology International, Inc. assumes no liability for misuse of the equipment it manufactures and sells. To assist customers and prospecitive customers in finding information on laws related to automated dialing and announcing equipment, we suggest that you go to our Telemarketing Laws page.